Weave video chat into your web (and now mobile!) application. Make sure You have Cordova 3.5.0 Installed. If you haven't, view Cordova instructions Page. iOS deloyment, as of March 14, needs additional setup. See FAQ/Troubleshoot. All your editing will be done in your www folder. To use the opentok library, make sure you include opentok.js file in your HTML document. // Do Your Stuff Here! when you include the js library from weinre, make sure to use your computer's ip address and not localhost! Located in example/www. To see the interop between mobile and web, simply deploy to your device and visit https://opentokrtc.com/cordova on your browser. All of the code resides in example/www/index.html and example/www/js/index.js. 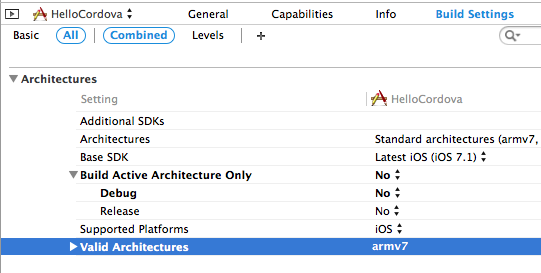 Go to project build settings and change 'Build Active Architecture Only' to NO. Do the same for cordovaLib build settings: change 'Build Active Architecture Only' to NO. The provided sample code works, but how do I use my own credentials? Replace data.apiKey, data.sid, data.token with your own apiKey, sessionId, token, respectively. How do I generate a sessionId or a Token? Copyright (c) 2014 TokBox, Inc. The software complies with Terms of Service for the OpenTok platform described in http://www.tokbox.com/termsofservice.